Earlier this year I toured Vietnam (I had been in China on business). 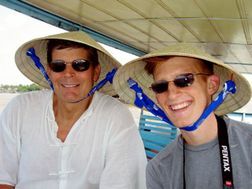 I was accompanied by my 21 year old son Alex (who was an exchange student in Hong Kong). It's interesting to note that when I was 21 in 1969, Vietnam was just about the last place I wanted to go. We spent all our time in and around Ho Chi Minh City (Saigon). This photo shows us in the Mekong Delta -- "ground zero" of last year's bird flu. If I were to describe my impressions of Vietnam in one word, I'd choose: BUSTLING! There is a tremendous amount of energy in the air. I'm guessing that 7 years ago, most people were on bicycles. Today, they're on mopeds. And, in 7 years, they'll all be in cars (like Shanghai). Many companies are rushing to invest in Vietnam. While we were there, Intel chairman Craig Barrett announced that Intel would be building a $305 million chip factory near Saigon. Quite a vote of confidence. We met a young research analyst from Goldman Sachs, and she said that her firm advises that "Vietnam has very good prospects in the medium term." 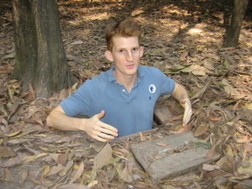 One of the highlights of the trip was traveling to the Cu Chi Guerrilla Tunnels (located about 60 miles northwest of Saigon). They were used from 1960 to 1975 by the Viet Cong and the North Vietnamese Army. The tunnels are built on many levels and create a giant cobweb of nearly 130 miles. They included sections for living, dining, meeting, and fighting. 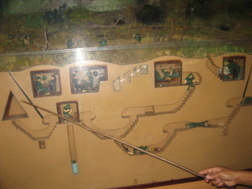 The adjacent photo shows a model of one section of the tunnels. It looks like an ant farm. 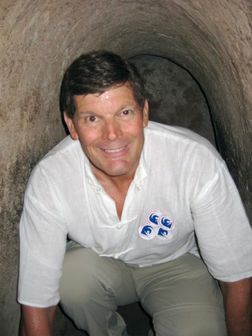 The tunnel entrances are very narrow. Here Alex is getting into the tunnel. We crawled through one section for about 35 meters. It is quite an experience. It is VERY DARK (except when a photo flash goes on), VERY HOT, and VERY CRAMPED. I would not want to be down there without a guide (or 40 years ago with bombs shaking the earth). 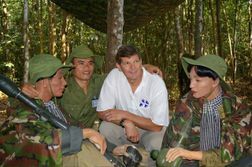 Here I am with our Cu Chi tunnel guide (second from left) along with some models of Cu Chi tunnel guerrillas. His name was Mr. Phong. A lot of people would like to be a guide there, but Mr. Phong was helped by the fact that his parents were real Cu Chi tunnel guerrillas from the 60s. (Kind of like being a legacy case to get into a good college.) Nearby was a huge crater caused by a bomb dropped from a B-52 in 1967. In 1967 at age 19, I worked in a defense factory in Los Angeles operating a drill press making holes in bomb triggers. It made me wonder if . . .
Good pictures mr. von Oech. I actually have pictures taken at some of the same places that you do. actually, i'm sure many from hkust that went to ho chi minh city do too. I can't wait for your post on Japan, that's one place i didn't get to visit. These tunnels really scare me ! The tunnel entrances are very narrow. To be honest I would not want to be in those tunnels period. You would keep remembering the grave in those places. But they had to dig those place to insure their resistance I guess.